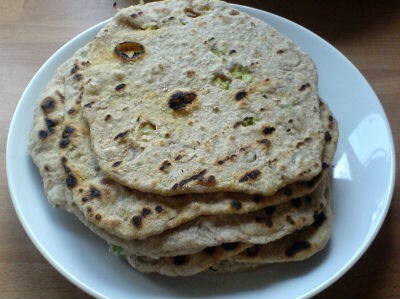 A delicious, nutritious and easy to make coriander roti (also called as coriander chapati). Coriander leaves are a great source of dietary fiber, potassium, calcium and other essential nutrients. 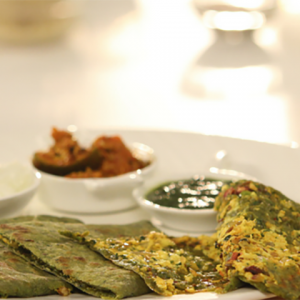 This roti is best served with curd or raita for breakfast or dinner. 1. Grind the onions coarsely and transfer to a large bowl. 2. Add the wheat flour, salt, red chilli powder, coriander powder, ginger paste and coriander leaves. 3. Add enough warm water and mix well to a thick, pliable dough. 4. Make small/medium balls and roll them out into medium size rotis. 5. Heat a nonstick tawa over medium flame. 6. Cook the rotis on both sides, adding little oil around the edges. 7. Remove and serve with side dish of choice. 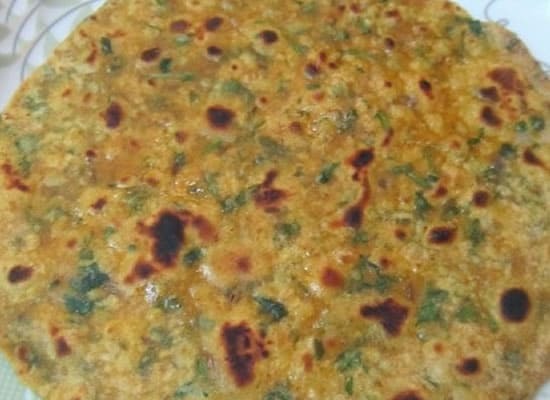 Feel free to comment or share your thoughts on this Coriander Roti (Coriander Chapati) Recipe from Awesome Cuisine.